How to play Krazy Keno Superball from IGT at online casinos? How to play Krazy Keno Superball from IGT at online casinos? How to play Krazy Keno Superball from IGT at online casinos? 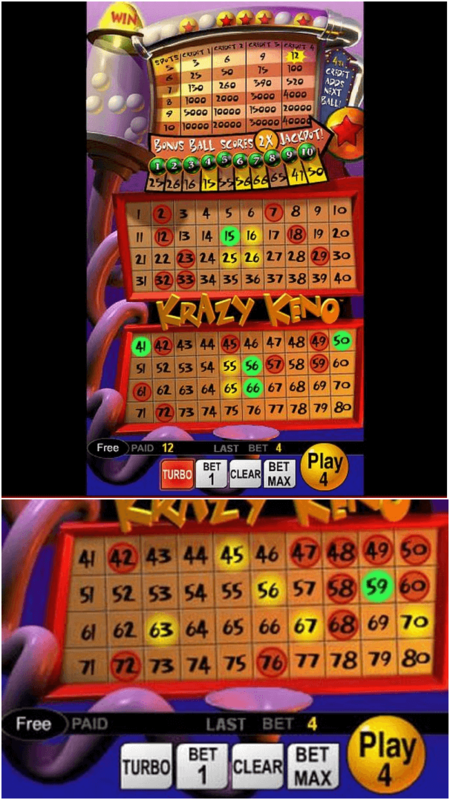 Krazy Keno Superball is a lottery style game with 80 numbers developed by IGT where a winner has to pick and choose a Krazy jackpot combination and win big. This simple to play has some betting patterns which you can explore when you start playing this game online at casinos. With this function aside you can sit back and watch the Krazy Keno Superballs launch themselves across the screen. How to play Krazy Keno Superball? You need to choose IGT powered online casino to that online casino that offers this Krazy Keno Superball game. Register yourself at the online casino of your choice and make a initial deposit with AUD or BTC or any other currency of your choice to play this game. Go to games lobby and browse the other games or Keno games section and find the Krazy Keno Superball game. Now picking the numbers is all that needs to be done by you which you can do by clicking the mouse on the numbers you want to play. These numbers will then be highlighted on the board for easy reference. Once the player is happy with the numbers picked then the player just needs to hit the yellow “play button” at the bottom right of the screen. At this point a bunch of Krazy Superballs scramble themselves across the screen landing in number positions. 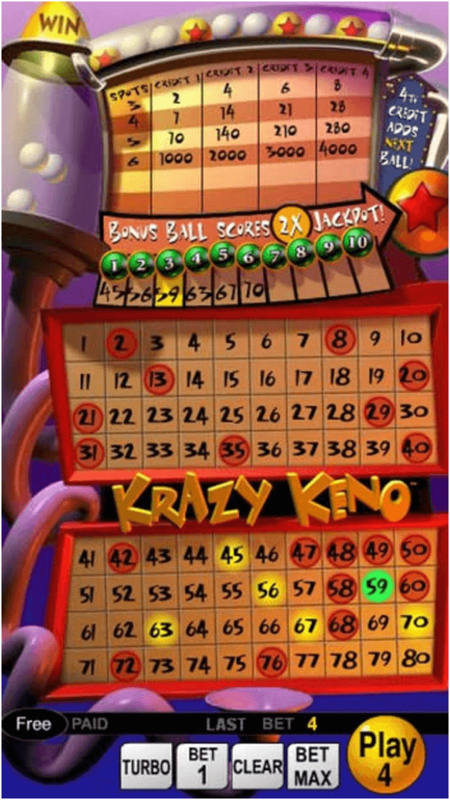 Overall there are 20 Krazy Keno Superballs that break out onto the screen giving players 20 out of 80 chances to hit, and players can select a maximum of 10 numbers and a minimum of 2 to play. In the end, the idea of Keno is for the player to hope that as many of these Superballs as possible will land on the player selected numbers for cash prizes. The Superball feature is activated when you play four coins per game. This gives you one ball marked with a star. If this ball lands on one of your selected numbers and that round wins your win is doubled. This means if you play the Pick 15 and hit all numbers with one being the Superball you win 40,000 X 2. You can play in the following coin sizes – 5c, 10c, 25c, 50, $1 – remember for the superball you must play 4 coins per game. The more numbers picked by the player the more the spots payouts will change in the table at the top of the screen. Spots are the minimum amount of numbers selected by the player that the Superballs need to hit before the player gets paid out. For example, if you only selects the minimum of 2 balls then if one number is hit the player will get paid, but if both numbers are hit the player win amount will be improved. On the other end of the scale if you select the maximum of 10 numbers the minimum numbers needed to be hit for a payout will be 5. The spots section of the table at the top of the screen will keep track of how many spots you will need to hit. In the same table as the spots count there is a credit column. Players can bet between 1 and 4 credits per bet by using the “Bet 1” button. To bet the maximum of 4 credits then the “bet Max” button should be used. The more credits you bet then the better the multiplier becomes as per the credit column in the table at the top of the screen. The max bet you can win up to 80,000 credits with a bonus ball! The numbers in the hopper come out in a random order; the more numbers you match, the higher your payout will be. Krazy Keno Superball online game also has a Bonus Ball feature; when you wager 4 credits during this feature, you have the possibility to double your award. If the Bonus Ball, marked with a red star and shown at the top of the hopper in a row, drops down into the hopper on the next game it may be part of the next 20 balls that drop. If the bonus ball is part of your winning numbers, your cash prize is Doubled! Below is the pay table for Krazy Keno Superball at Wagerworks casinos. 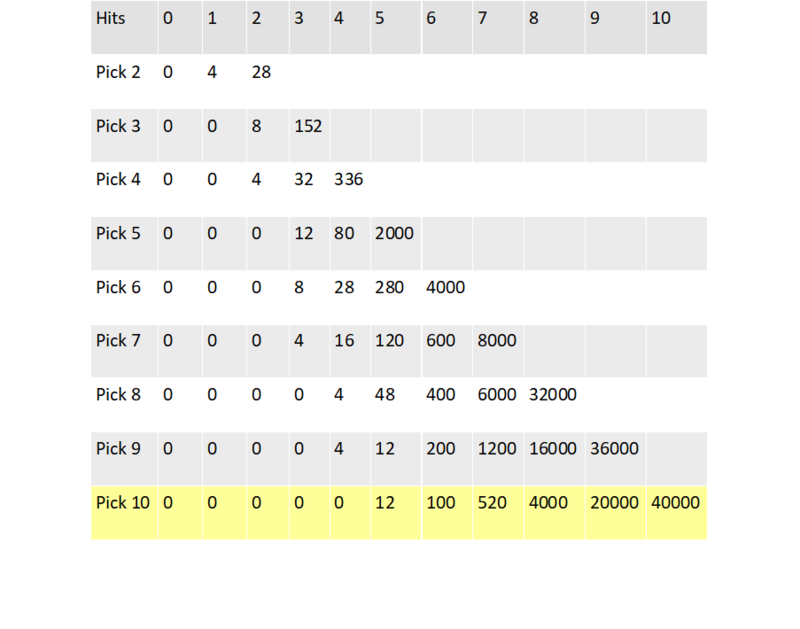 As you can see the jackpots really jump up from the Pick 8 onwards. The Pick 10 (Highlighted) still offers the best return. The Superball can double all of the wins if it hits a selected number. Play Krazy Keno Superball and online casino and see how many numbers you can guess, as well as how many super-balls will fall down the shute for you in the game play. This game is artistically rendered for fun game play and the average return is 96%. Bet from .50 to 4.00 credits per game round. This game from IGT or wager works offer actual games that are found in Las Vegas and other land-based casinos around the world. While there are two version of keno available at Wagerworks casinos the best game is Krazy Keno Superball where you can win jackpots as high as 80,000 coins.